Billions of dollars are poured into startups every year and U.S. venture capital investment reached 70B again in 2017. Yet amazingly, even with that much capital coming in, 70% of venture-backed startups still fail and 90% of startups fail overall. What’s worse, the failure rate has not decreased as a result in venture capital investment. Well, for starters, startups often don’t learn why startups fail. Part of that reason is because the startup industry hasn’t educated people enough about it. So the same mistakes keep getting repeated time and time again. While there is a great book on startup failure called The Founder’s Dilemmas: Anticipating and Avoiding the Pitfalls that Can Sink a Startup, it’s based entirely on issues with the team. And while team-based failure analysis is very important, there’s a lot more to a startup aside from team structure, hiring, dilemmas, and dynamics. Because what’s even more important than the team as a whole, is the people within the team. 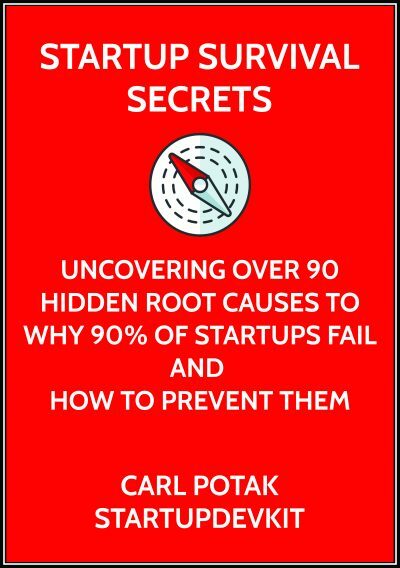 That’s a large reason why I, Carl Potak, StartupDevKit’s Founder/CEO, have been writing a book about it called Startup Survival Secrets. Each individual has a very important role and in Startup Survival Secrets, I explore and explain the significance of the people within the team. 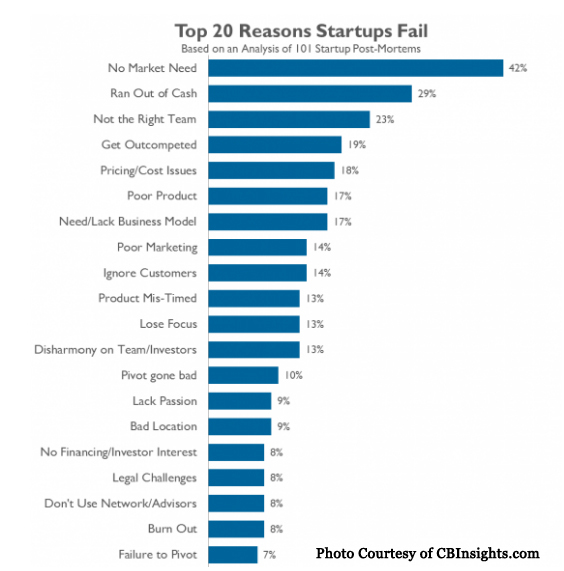 That’s why I chose to use the top 20 reasons why startups fail which are from a study by CB Insights on venture capital-backed startups who’ve failed and had participated in the study. What’s great about the study is that it enabled me to analyze the startup industry’s worst problems and reverse engineer the top 20 reasons why startups fail. I wanted to get heart of each reason for startup failure and explain the significance of the problems and solutions. To do this, I brainstormed and researched the root causes for each of the top 20 reasons. And from that research, I was able to illuminate not only the root causes, but how to prevent each root cause from occurring and what to do instead. I’ve included advice on startup development and growth, practical insights, resources to help startups with the subject matter, encouragement, and more. If the startup community is ever going to break this vicious cycle of failure, and create the best opportunities for courageous entrepreneurs creating solutions for people in need, then we’ve got to make education on startup failure a priority. In addition, I encourage you to check out this blog post I published called Why Learning About Startup Failure is Critical to Success.